When Heat is up in Middle summer in India, The Cricket fever will Raise, Yes we are taking about Indian Premeire Leage,The IPL matches.After Successfully Completed the 10 years, The 11th Edition of VIVO IPL ( Indian Premier League )will begin at the Mumbai Wankhede Stadium.Defending champions Mumbai Indians will play agains Chennai Super Kings. 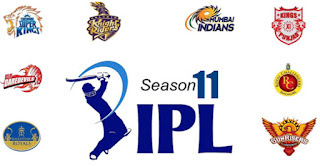 After Missing the 10th Edition of IPL, Chennai Super Kings are back in 11th Edition and play in a inagurational match. Total 8 Teams are Participating in the Tournament. The upcoming edition of the cash-rich league will feature 12 matches that will be played at 4:00 PM IST and 48 matches will start at 8:00 PM IST.